In honor of World Water Day, here’s an interesting riddle: There are two kinds of water sources for a town, surface and underground. In times of adequate rain, that water can be used for human activities from farming to consumption to mining and so on. But let’s say the rain stops for a long time. Fortunately, the town also has an underground lake. And during the drought, the town uses the water from the underground lake. The town can pump and pump and pump water from the underground lake, but – in spite of no rainfall – the water level never seems to diminish. It’s like a magic glass that never empties. The map below shows how much water would cover dry land if all hidden aquifers were suddenly above ground. The lightest shade of blue indicates a depth of one meter or less, a depth through which most adults could easily wade. It might look like the planet is awash in potable water. But it’s not. Darker blue would create lakes, while the darkest blue points to very deep water. Almost 95 percent of underground water is very deep water that hasn’t seen the light of day for anywhere from decades to eons, is probably saltier than the seas and could contain heavy in toxic minerals. A map of the Earth’s groundwater by University of Victoria’s Tom Gleeson, and colleagues from the University of Texas at Austin, the University of Gottingen, and the University of Calgary. From the underground seepage of the nearby Colorado River, which is counted as a separate surface water system from the aquifer beneath Needles. Also, the Colorado River is in a different state, and thus subject to different water distribution regulations than the aquifer beneath Needles. In the past, surface water from various regions and underwater aquifers have all been counted as separate water sources. Which is to say, the water that flows in the Colorado River has been counted as distinct from underwater resources in adjoining regions. In the Needles District of Canyonlands National Park near the Colorado River. As it turns out, however, many of these water resources are interconnected. So the never-ending underground lake beneath Needles is, in fact, depleting the Colorado River. 35 percent of water used by humans comes from underground aquifers; more in times of drought. In California, those numbers are usually around 40 percent – during the drought, it’s gone up to 60 percent. All that water has to come from somewhere. Water accountancy has long been a contentious issue, both in the American Southwest and elsewhere. The water we see or can pump doesn’t always represent what’s really available. But laws and ownership rights have been based on accounting for water as if what we see is what we can get. 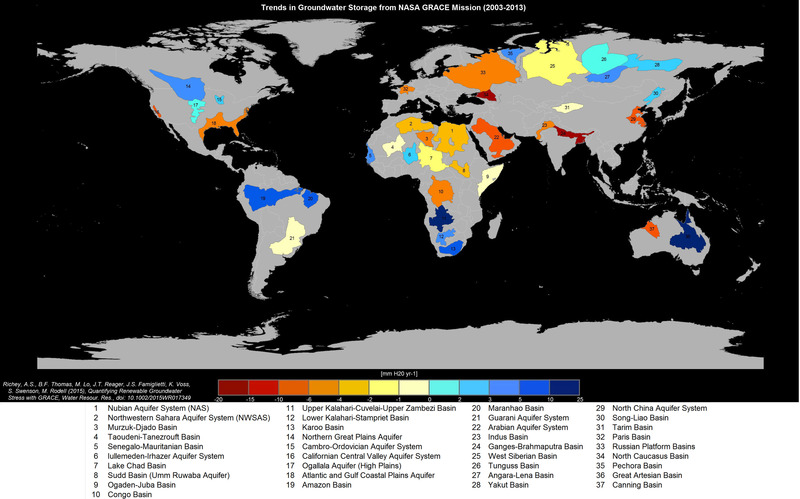 A recent study mapped levels of underground water basins around the world from 2003-2013. Satellites were able to chart changes in aquifer levels as they flew overhead because water is so heavy that it exerts a pull on orbiting spacecraft. Results of this study show that 13 of the world’s 37 largest underground reservoirs were being emptied with no signs of replenishment. Some of the most overstressed water supplies were in the world’s driest areas: Arabian Aquifer System, an important water source for more than 60 million people; the Indus Basin aquifer of northwestern India and Pakistan, and the Murzuk-Djado Basin in northern Africa. Many of these aquifiers lie directly beneath political and cultural borders that are already flashpoints of hostility. If California is any example (and when it comes to drought and water challenges, the state is a proverbial coal mine canary), then water is interconnected in more ways than one. But Needles, at least, is only drawing water from a sister state in the same union. The same can’t be said of other places around the world. Water sustainability doesn’t just mean a good supply of water. It means a supply of human activity, of food, and of peace. Scary! Have you seen the movie The Big Short? Real-life financial market genius Michael Burry (portrayed by Christian Bale in the movie) is now focussing his trading on one commodity: water. In an article posted on the New York magazine website (http://nymag.com/daily/intelligencer/2015/12/big-short-genius-says-another-crisis-is-coming.html), he is quoted as saying: “Fresh, clean water cannot be taken for granted. And it is not — water is political, and litigious. Transporting water is impractical for both political and physical reasons, so buying up water rights did not make a lot of sense to me, unless I was pursuing a greater fool theory of investment — which was not my intention. What became clear to me is that food is the way to invest in water. That is, grow food in water-rich areas and transport it for sale in water-poor areas. This is the method for redistributing water that is least contentious, and ultimately it can be profitable, which will ensure that this redistribution is sustainable. A bottle of wine takes over 400 bottles of water to produce — the water embedded in food is what I found interesting.” This seems to me to be very cold and calculating and exactly the way of the world. Hopefully, water sustainability can be addressed for the sake of peace and humanity. I have seen that movie – brilliant. This thing of transporting water via food (especially grain) is something the Chinese have been good at for a very long time. Look up the Chinese involvement on the African continent and you’ll find a tale of a country that has squandered its own water and is now using the water of other continents to feed its people – under the guise of investment. I feel like I wrote something about this before, but probably not in such a direct form…I feel a blog post coming on. I did write this about China’s rivers. I will look it up! And read your post. Interesting subject.